Imogen Foxy Locks: Foxy Locks Extensions Contest Giveaway! 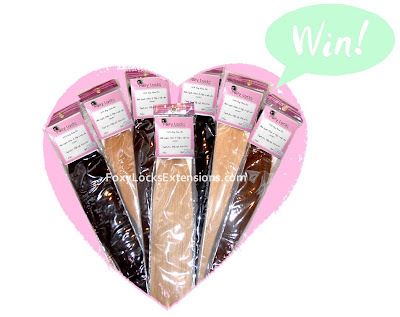 I will be doing a contest this week where one of my lucky Youtube subscribers will win a set of Foxy Locks Extensions. I am going to make it a video response contest (either send in slide show pictures or an actual video). I will announce the rules and what i want everyone to do in my contest video which will be up this week. Can't wait! AHH I'm so excited, I just ordered the blonde ones, but I also mix it with a dark brown which I wear underneath. I couldn't afford to get both at the moment. What's the contest gonna be? I have to win!!! I haven't received them yet as I'm in Texas in the US, but I am a guru on youtube and would love to review them. I haven't talked about my extensions with my subscribers yet and they are always asking about my hair, basically what kinda shampoo and stuff that I use and how pretty it is, I can't wait to review them, I'm sure they will be surprised. I love your channel and of course your hair!!! Keep up the good work!! Hi, I have natural long thick hair and just love your video's! I just cant seem to keep the bobby pin's in my hair :( do you have any suggestions of how I can keep them in? Hi there! I absolutely love your hair extensions. I usually wear Ken Paves extensions but I really want to try yours and some of your lashes as well! I do have a question though, I recently cut my hair short in the back. Does your hair have to be 6 inches or longer to use your extensions? Or can you still camouflage them with the short hair? Thank you so much! I watch your tutorials religiously on youtube. : ) you are stunning!